Its unclear which one of us, my husband or I, initiated the discussion about chickens. He had a pet chicken when he was a kid… he has fond memories. Although he doesn’t remember how long he had the chicken or how it died… but he swears it laid one egg every day. My family also had chickens when I was growing up… I just had different memories. Not bad or good, just different. For example, I remember my dad and uncle chopping heads off chickens. I remember my sister getting her eye pecked by a rooster and having to go to the hospital. I remember I showed a chicken at the fair… I don’t think it was very successful though. Sort of like my goat (“Downy” the goat), but that’s another story. I also remember going to get the eggs one day and sticking my hand in the nest and hearing a snake hiss at me in return. That was scary. But it was Arizona and snakes weren’t that uncommon. SO definitely my memories are drastically different from my husbands. But for quite some time we have wanted to get chickens. 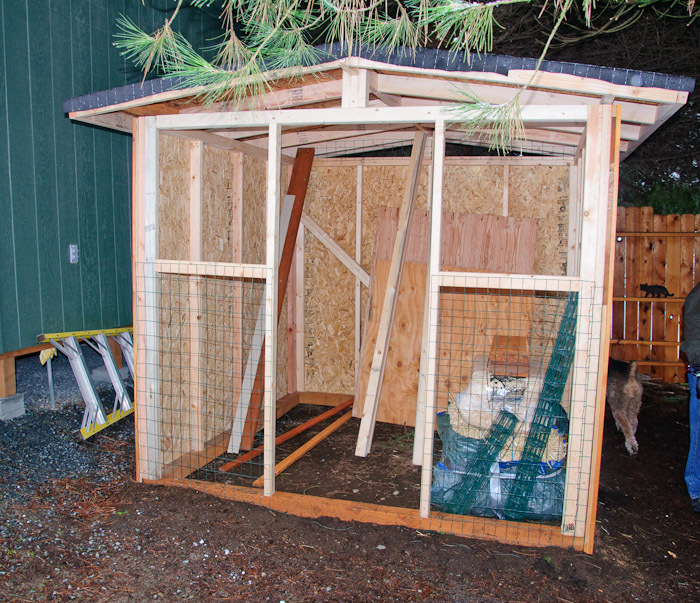 About 4-5 years ago we went on a chicken coop tour in King County… they had the coolest coops and everyone was very supportive and encouraging. Then last year we went on the Everett coop tour… and the coops there were very different. They were utilitarian and not real elaborate. But again, everyone was very helpful and informative. A friend of our has to give away his three chickens… and we have agreed to take them and are now beginning the process of learning how to raise chickens in a semi-urban environment. But I would really like to have a variety of chickens… and to raise some from chicks. Yes, I perhaps should remember the trauma of raising our dog Titus from a puppy. My husband has vowed never to have a puppy again. But chicks… they are so little and cute. How hard could it be? So we went to a class on raising chicks. It was done by Seattle Tilth (http://seattletilth.org/) and was a great class. Taught by a man named Paul Farley (spelling may be wrong) who clearly knew a lot about poultry. It sure does sound like chicks are exactly like babies… they poop and eat, sleep and chirp. But it was a good class that helped me remember a lot about raising chickens. 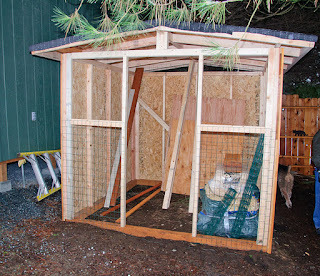 Here are some of the pictures of our coop in process. Its not done yet but I will post the final pics when its done. 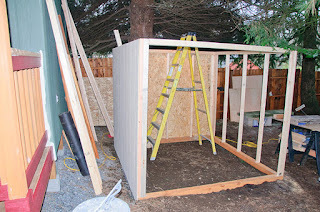 This is the first phase of our chicken coop. 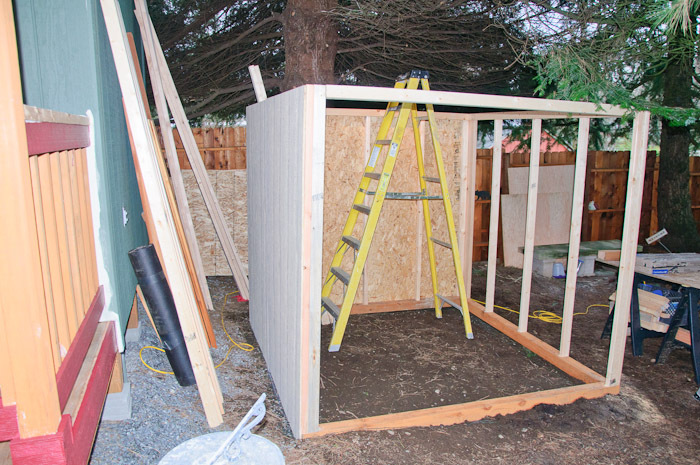 Phase 2 – roof and chicken wire on. So now we have to figure out what chicks to get and where. The three hens we will be getting are an Americauna, a Barred Rock, and Rhode Island Red. I know that the chicks I want are called Black Copper Marans that lay dark brown/chocolate eggs. I think they look so cool… its hard to see in the picture but they have dark speckles.